Kelly B. Weaver, MSN, RN, OCN, Clinical Research Specialist at Beebe Medical Center’s Tunnell Cancer Center, has earned her Oncology Nursing Certification (OCN), validating her knowledge and skills in working with cancer patients. This accomplishment also reflects her focus on offering quality care to the patients at the Tunnell Cancer Center. Kelly, originally from Baltimore, Maryland, graduated from Towson University’s School of Nursing in 2006 with a Bachelor of Science degree in Nursing. While at Towson, she was awarded for academic excellence with membership to Sigma Theta Tau International. In 2007, she accepted a new graduate nurse position at Beebe Medical Center, and worked for five years on the third floor in the Medical-Surgical Unit. While there, she cared for patients across the lifespan with varied diagnoses and developed an interest in oncology. 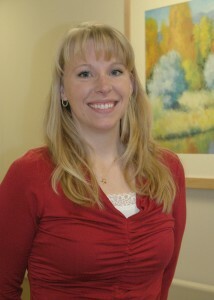 Kelly was accepted into the University Of Delaware School Of Nursing’s Clinical Nurse Specialist program in September, 2009. Her graduate clinical experience at the Sidney Kimmel Cancer Center at The Johns Hopkins Hospital in Baltimore, Maryland, affirmed her focus on the care of patients with cancer diagnoses and their families. She accepted a clinical research position at the Tunnell Cancer Center in November 2012 and passed her OCN certification in December. Days later, she completed her graduate coursework and earned the Master of Science degree in Nursing. To date, 53% of the clinical nurses working at Tunnell Cancer Center have earned the Oncology Nurse Certification.